Work worries cost the average business owner 21 days of productive time every year, or the equivalent of $10,000 annually, according to new research by Alarm.com and OnePoll. Our survey of 1,000 American business owners indicates that the average owner loses 44 minutes of productive work time every day to work worries: business-related worries about issues such as cashflow, time management, security, the economy, bills, and employee reliability. Over the course of a year, these 44 minutes a day add up to 191 hours. That's a month of workdays—or, with the average owner valuing their time at approximately $50 per hour, nearly $10,000 a year in lost productivity. Related: Got Work Worries? Smart Business Security Can Help. 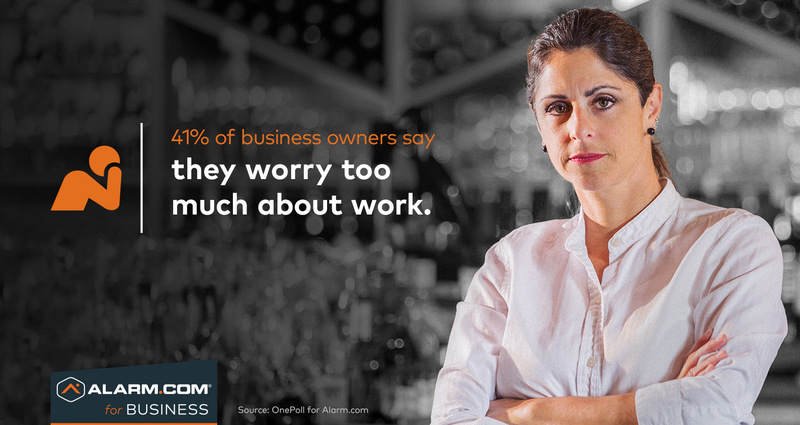 Overall, 41% of small business owners report that they worry too much about their business. "Business owners are vulnerable to work worries because they take on so many different responsibilities," says Anne Ferguson, Alarm.com's vice-president of marketing. "When you have customers to serve, employees to manage, bills to pay, and only so many hours in a day, work worries can build up. The good news is that most owners get better at managing their work worries over time—and that new business tools and technology are here to help." 2: Work Worries Don't Just Happen at Work. The average owner brings their work worries home 3 times a week. For 35% of owners, work worries follow them home five times a week or more. In fact, one in four owners worry work more at home than they do at work—and more than one-third report that work worries have spoiled a family event or personal occasion. For owners who worry at home, the ability to quickly check in on their business may be valuable. This smart business security user, for example, considers her Alarm.com smartphone app an essential safeguard for her peace of mind. Here's the good news: most owners (62 percent) say that they've become better at managing their work worries over time. Three quarters (74 percent) of owners say that despite their work worries, they wouldn't change places to work a nine-to-five job. "Business owners tend to be resourceful, adopting new tools like smart business security to address and manage common work worries," says Alarm.com's Anne Ferguson. "We're seeing business owners using Alarm.com technology to reduce costs, save time, automate troublesome tasks and stay in control when they're offsite. Over time, these benefits can significantly reduce an owner's work worry burden." What is Alarm.com for Business? Alarm.com for Business is a smart business security solution that combines security, video monitoring, access control and smart thermostats into a single system, controlled by a single smartphone app and web dashboard. Professionally installed, monitored and supported by expert service providers, Alarm.com for Business helps owners protect their business and employees, save time and money, and stay more aware and in control of what's going on. To find out more about smart business security, click here. What is a Smart Business Security System?